Damit haben wir auch für nächstes Jahr ein “Call to Action”: Wir brauchen Moderatoren! Wünschenswert wären für 2015 sechs Moderatoren, so dass wir insgesamt mehr Energie für die Inhalte der Meetups aufbringen können. Jan Nonnen, Christoph Baudson, Andreas Kluth und ich machen als Moderatoren weiter. Das heisst, wir brauchen noch zwei neue Leute im Moderatoren-Team. 1) Thema wählen. Normalerweise stammen die Ideen dazu aus vorraus gegangenen Meetups, oder von der Mailing Liste. 2) Passende Location wählen. Wir haben einige Alternativen schon aufgelistet . 5) Beim Event anwesend sein und sicherstellen, dass alles rund läuft. Wir fangen nächsten Jahr an im Februar, mit einem Meetup am 3. Februar (Coding Dojo vielleicht?). Bis dann, genießt die Feiertage, und kommt gut ins neue Jahr! The topic of this year's last meetup was "documentation". As stated in the Agile Manifesto, we value "Working software over comprehensive documentation". So is there any need for documentation in agile projects? 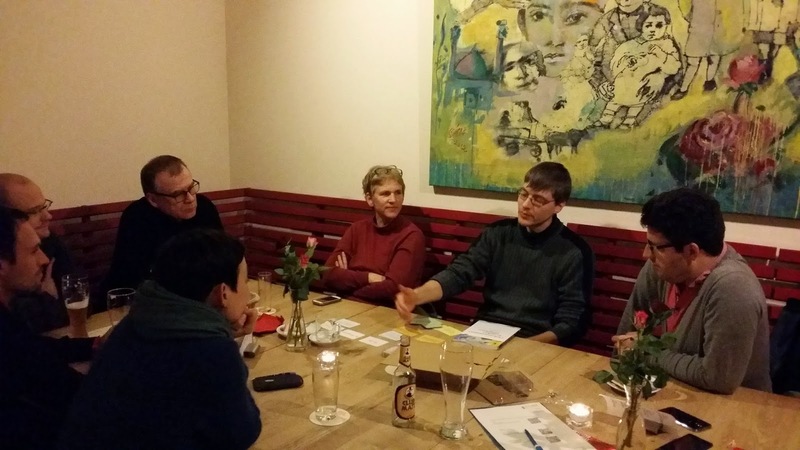 This time we decided not to have a presentation, but a discussion in a relaxed bar atmosphere. We met at "Kulturkneipe" in a culture center in Bonn Beuel, which is usually frequented by cinema goers and theater folks. Nine people showed up, and we split up into two groups to allow everyone to take part more actively in the discussion. 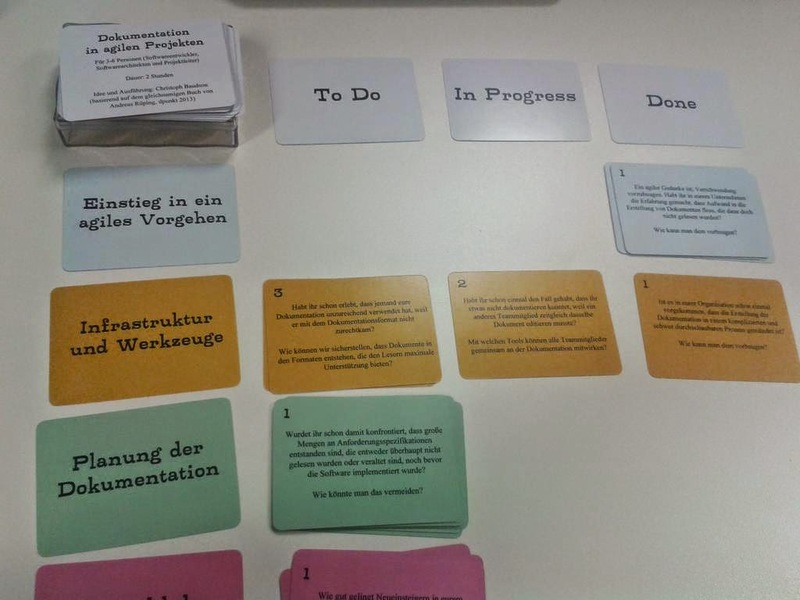 We prepared a Q&A card game based on the book "Dokumentation in agilen Projekten" (Documentation in agile projects) by Andreas Rüping. Each card represented a pattern described in the book, a typical problem with a suggestion how to solve it with proper documentation. Playing the game took about two hours and triggered an interesting exchange of perspectives and ideas. The obvious answer was, that documentation is not obsolete in agile projects. A lot of participants shared both how they dealt with documentation on a technical level (wikis are very popular, as is the whole Atlassian suite) and on a people level (making sure to have people with skills in technical writing, or having people responsible for documentation). Please feel free to add more information or links in the comments! 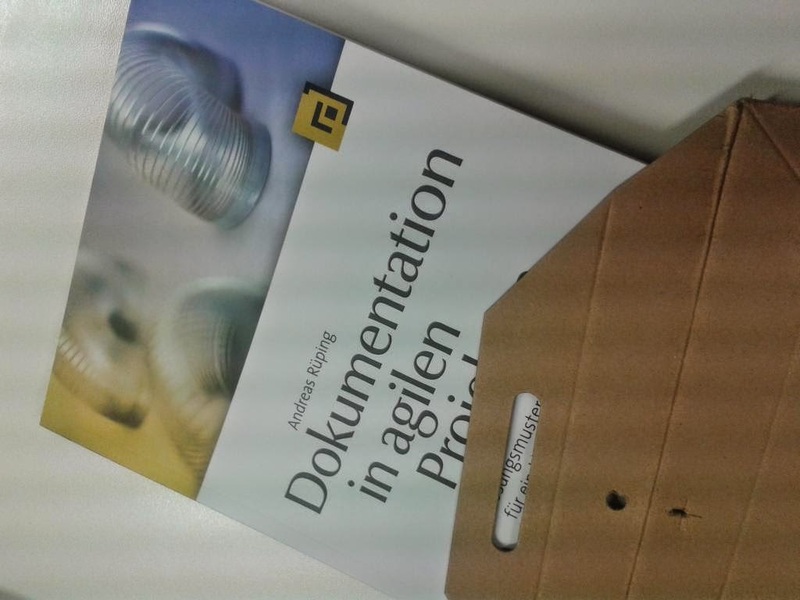 After the discussion the two groups joined for a retrospective, and we gave away a copy of the book "Dokumentation in agilen Projekten", provided by our sponsor d.punkt. Thanks to our contact Martin Wohlrab at d.punkt! Please keep an eye on our Twitter channel to get information on the next meetup, or subscribe to the mailing list! 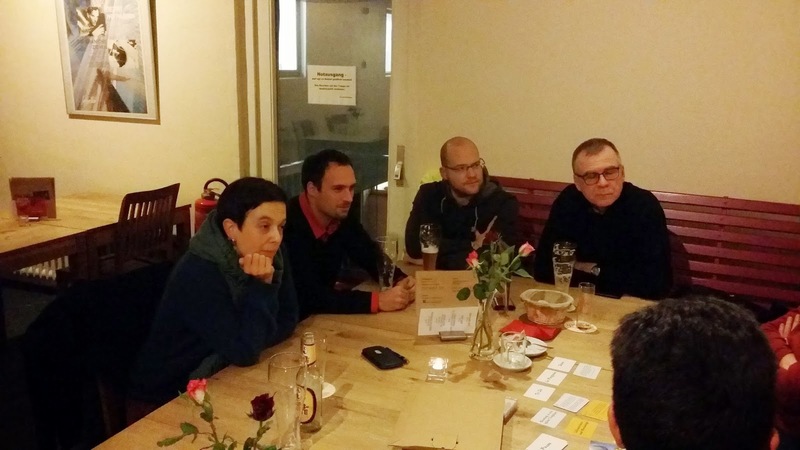 Gestern sehr interessantes #bonn #agile Meetup zum Thema #Dokumentation. Dank an @bonnagile & @sustainablepace, wir haben viel gelernt! Big thanks to @sustainablepace for yet again providing the @bonnagile meetup with an original and discussion-worthy topic!